My printmaking has been influenced by printmakers and artists from many different parts of the world. Links to blog pages for detailed overviews of my main sources of inspiration from different countries can be found below in alphabetical order. Many more visual references are shown in my logbooks. Njideka Akunyili : Nigerian artist, now working in US. She produces collaged paintings that could be basis for developing large chine colle versions of my Africa sketches. Ibrahim El Salahi : Sudanese artist and painter who produced powerful political as well as spiritual works. Part inspiration for ‘The Dance’. Seen at Tate Modern exhibition September 2013. Mark Graver : New Zealand artist produces abstract carborundum and acrylic resist etchings inspired by maori designs and landscape. Wrote book ‘Non-toxic Printmaking’. Katarzyna Cyganic : detailed etched linocut landscapes. Edgar Degas: artist who produced some of the earliest monochrome monotype prints. He often used prints as basis for pastel paintings. Georg Baselitz : artist who did very large linocuts, often abstracted through printing upside-down. Exhibition at British Museum 2014. German Expressionist woodcuts : many German artists produced woodcuts of landscape, portraits, townscapes and figures. Benedetto Castiglione : invented the monotype process in 17C. 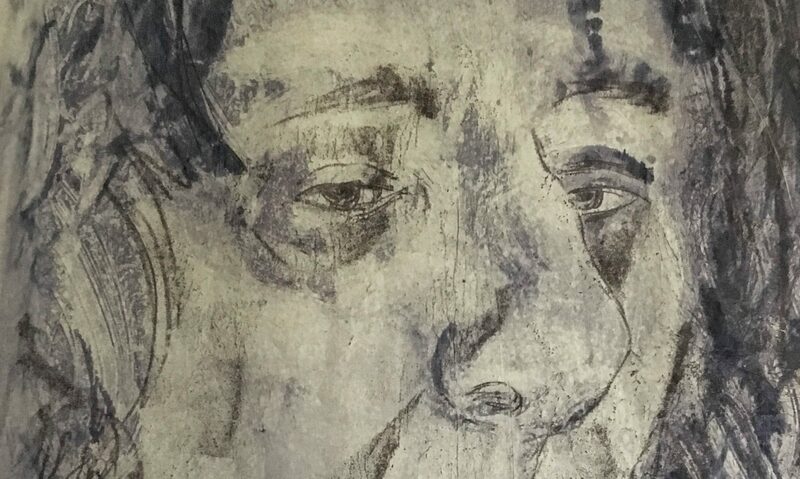 Very detailed painterly monoprints of portraits and figures. Angela Cavalieri : large linocuts often based on typography. Yayoi Kusama : feminist painter who produces very powerful psychological images, often very colourful and/or based on abstract pattern and repetition. Seen at Tate Modern exhibition 2012. Toko Shinoda : abstract artist who also produces large abstract lithographs inspired by Zen aesthetics. Koichi Yamamoto : prouces very large black and white abstract or semi-asbtracted monoprints. Frans Masereel : produced graphic novels in woodcut about city life. Rembrandt : produced dramatic monochrome etchings. Lyubov Popova : avant-garde feminist artist who produced abstract linocuts. Rolf Nesch : Norwegian artist who produced some of the first collagraphs, often using very think metal ‘material pictures’. Sybil Andrews : Grosvenor School linocuts. Wilhelmina Barns-Graham : Cornwall artist whose line drawings of the sea inspired some of my monoprints. Edward Bawden : linocut artist. Sandra Blow : Cornwall artist whose abstracts of the sea inspired some of my monoprints. Helen Brown : linocut landscapes produced on site outdoors. Lynda Burke : linocuts of ladnsca[es, gardens and interiors , mostly black and white sometimes with splash of red. Patrick Caulfield : painter and colourist. An inspiration for ‘the patio’ linocut. Sees at Tate Modern exhibition 2013. Claude Flight : Grosvenor school linocuts. Jess Freeman : very dramatic clack and white linocut landscapes, often imagary. Terry Frost : Cornwall artist whose abstracts inspired my monoprints of St Ives. Brenda Hartill : abstract collagraph artist who uses a wide range of surfaces and delicate use of colour. David Hockney : artist interested in bending perspective and different use of colour. Kurt Jackson : Cornwall mixed media landscape artist. His paintings of miners and mines and use of spattered colour inspired some of my monoprints. Sue Lowe : collagraph landscapes. Hughie O’Donoghue : abstract and figurative artist who produced a series of large black and white carborundum collagraphs using textured acrylic. John Piper : artist whose dramatic paintings of landscapes and buildings inspired some of my collagraphs. Cyril Power : Grosvenor school linocuts. Lil Tschudi : Grosvenor school linocuts. Elizabeth Catlett : civil rights artist who produced black and white linocuts and woodcuts. Alex Katz : flat colour screen prints. Christine Koch : Canadian printmaker who produces linocut landscapes and seascapes. Gary Ratushniak : native American printmaker who produces linocuts based on native American motifs, inspired by the stype of Sybil Andrews. Margaret Taylor-Burroughs : civil rights artist who produced black and white linocuts and woodcuts. Joe Vandello : interesting duo-tone prints using cardboard.